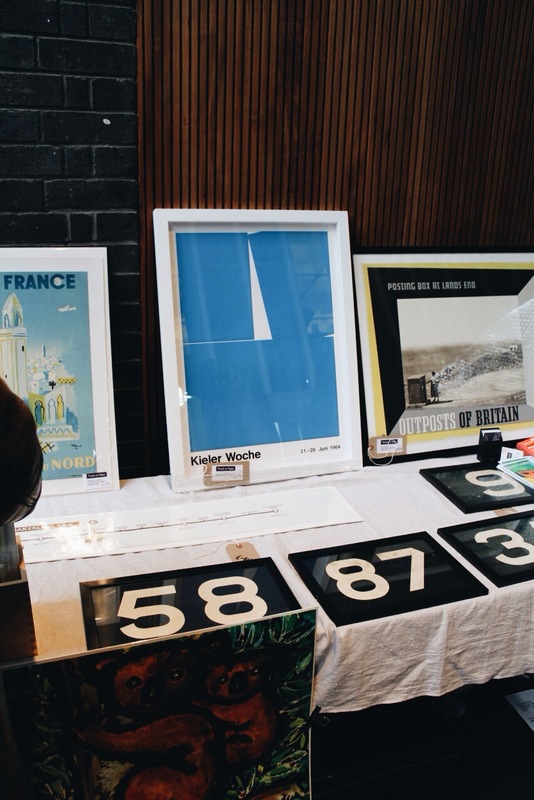 On Sunday, I took my brother Will along to the Midcentury East show, based at Haggerston school. Designed by Erno Goldfinger, the school itself is a great piece of midcentury architecture. Sunday it was filled with the very best of the UK's top Midcentury modern furniture dealers, and I went along to take snaps, pick my favourite pieces and meet some dealers. We arrived after an easy drive from Croydon. I don't think I've ever flown through London so quickly, green lights everywhere! On the door I met Lucy Ryder Richardson, founder of the show in the flesh, after interviewing her recently over email. 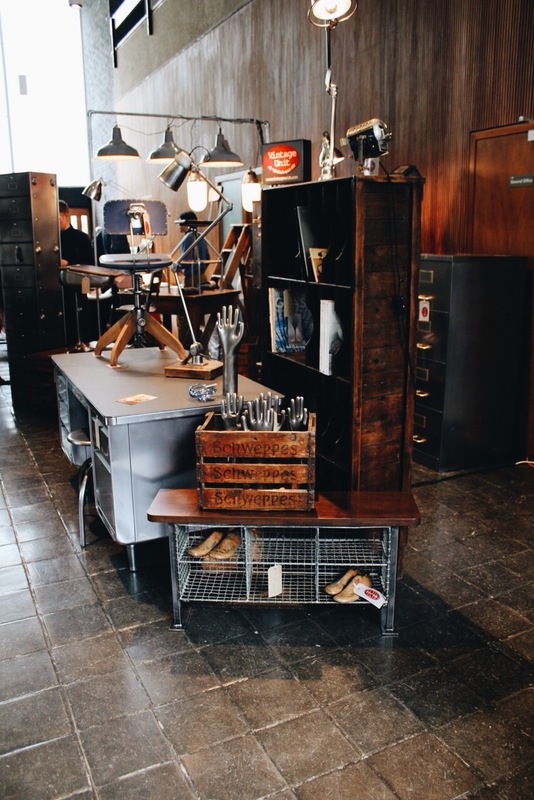 The entrance hallways was filled with industrial midcentury goodies and further down we could see some artwork stands. But before getting carried away we went into the first room, the school's main hall and one of the biggest rooms of the day. Whilst moving around and gawking at the beautiful furniture I made sure to grab some snaps of the architecture and finishes, all still so true to their original day. Ha ha! What a great character. He had this beautiful icicle sculpture that I fell in love with, but at the £175 price tag I knew I wouldn't be able to get that one past hubby without some strange looks. So I walked away, staring longingly... I will dream of you icicle! My brother and I both adored this Burmese girl dancer piece, which is still available from Saunders Fine Art for £280. Might have to save for that one and make a purchase! b) every piece here is in perfect condition, with a totally unique look. No junk sales scrambles here, this is QUALITY. The dealers of the area with the large light my brother is standing next to are GP Lights and More, the perfect sideboard is from DaSilva Interiors, and the music station is from Retro Bazaar, who have some really great and affordable decorative items. Just as we thought we were reaching the end we walked through a small hallway and into... another HUUUUUGE room full of goodies! The sofa area really beats DFS huh?! The wire chairs are by Warren Platner and sold by Flure Grossart and were even featured in James Bond's 'The Quantum of Solace'! This fair gets bigger and better every time I come along. I was truly overwhelmed by all the fabulosity (as my girl Kimora Lee Simmons would say, what's up Kimora). Just as I thought we had taken in as much as would could, this beautiful, crazy, cool piece caught my eye. I turned round and was met with a cool, flame haired girl. 'I'm Alys, from Nanadobbie!' she said. Ahhh! I knew this name! Alys is one of the Antiques Young Guns, a group of young dealers under 40 who are creating ripples throughout the antiques industry by bringing the old to the world of the new. I'm a big supporter and have even been along to a dinner where I met most of the young guns themselves. I was hoping I'd one day meet Alys, as she's one of the few AYGs who deal in mostly 20th century antiques. Alys was super easy to chat to and had some pretty special stock. I'm absolutely smitten with that floor lamp! After a quick chat and a vow to meet again, Will and I headed outside to grab a bite to eat after I made my one purchase of the day, a brilliant abstract print from Design: Post War & Before (I can't find a link to their site anywhere - annoying)! I won't share it now as will save for when it's hung. I tried to cut it down to three but I just couldn't. In fifth place It's the funky palm tree lamp from nanadobbie! Fourth up is the Burmese dancing girl from Saunders Fine Art. Third is that brilliant, light catching icicle ornament from the man without a business card who hates the word vintage. Is the William Plunkett geometric chrome armed, leather upholstered and Rosewood shelled armchair from 20th Century Marks. Seriously dying and going to heaven here (you hear me say that a lot right? I like armchairs). First up are the beautiful Art Deco chairs from MAR-DEN. I loved them so much I even went back for a second angle. Yum. So that's my Midcentury Modern show done, until next time! To find out when the next Midcentury Modern show is on and where, check out their site. If you have any questions about who was selling any pieces in the pics above, just ask. I have all of the card and can probably remember who was selling what. Have you ever been to the Midcentury Modern shows? Would you go along next time? Leave your comments below in Disqus!